MOUNTAIN VIEW, Calif. Researchers at the SETI Institute and the University of California, Berkeley SETI Research Center have applied machine learning techniques to detect 72 new fast radio bursts (FRBs) emanating from the "repeater" FRB 121102. The findings are part of the Breakthrough Listen initiative that aims to find signs of intelligent life in the universe. FBRs are bright pulses of radio emission originating from distant galaxies that last milliseconds. Most FRBs have been witnessed during just a single outburst. In contrast, FRB 121102 is the only one to date known to emit repeated bursts, including 21 seen during Breakthrough Listen observations made in 2017 with the Green Bank Telescope (GBT) located in West Virginia. Astrophysical Journal accepted the results and are on the arXiv service, officials explain in a release. UC Berkeley doctoral student Gerry Zhang is the lead author of the paper; Dr. Andrew Siemion, Bernard M. Oliver Chair for SETI at the SETI Institute, Berkeley SETI Research Center Director and Breakthrough Listen Principal Investigator, co-authored the work. In the original discovery in August 2017, the science team observed the FRB FRB 121102 for five hours, using digital instrumentation at the GBT. The results pushed Zhang and his collaborators to develop new machine learning algorithms to reanalyze the 2017 GPT database ultimately finding an additional 72 bursts that were not detected. The team trained an algorithm known as a convolutional neural network to recognize bursts found by the classical search method used by Gajjar and collaborators, and then set it loose on the 400 TB dataset to find bursts that the classical approach missed, according to SETI. "Gerry's work is exciting not just because it helps us understand the dynamic behavior of FRBs in more detail," says SETI Institute Bernard M. Oliver Chair for SETI Dr. Andrew Siemion in a release, "but also because of the promise it shows for using machine learning to detect signals missed by classical algorithms." To accomplish this gaol, the SETI Institute is using IBM Cloud and AI algorithms to analyze over 20 million signals captured by the ATA radio telescopes. In addition, scientists at the SETI Institute have used use the IBM Cloud to search for wide-band signals from exoplanets of interest allowing the ATA to be used for entirely new types of observation programs. 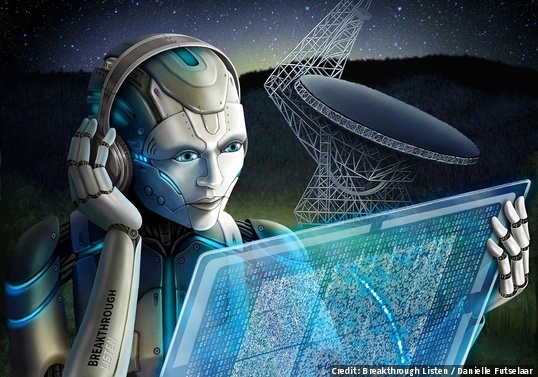 “These results hint that there could be vast numbers of additional signals that our current algorithms are missing and clearly demonstrate the power of applying modern data analytics and AI tools to astronomical research,” says SETI Institute President and CEO Bill Diamond. “Applying these techniques in the search for evidence of extraterrestrial technologies, or technosignatures, is incredibly compelling, together with addressing the tantalizing phenomena of FRBs."